One of my goals this year was to search for and locate audio systems whose tonal balance approximates that of live music. There has been a long-standing rift between the priorities of music lovers and audiophiles, which has been clearly reflected in current speaker designs. Audiophiles seem to prefer a super-etched, super-fi, presentation with more detail than live music has to offer. A rising frequency response in the upper midrange and lower treble is pretty common. Couple that with a weak lower midrange and upper bass and you end up with a balance no music lover would enjoy. I’m sad to report that audiophile-based designs are dominating the scene. Having covered about 80% of the high-end CES exhibits at the Alexis Park Hotel and much of T.H.E. Show, I can only point to a total of nine rooms that passed my test. Too bad; I hope to make it past ten next year. With apologies to those exhibitors I did not have the time to visit, here’s my short list of “Best of Show” finalists, where music was king. 1. I felt very comfortable in the Furuyama Audio Lab (FAL) room. Having lived exclusively with full-range and wide-range driver technology for almost 10 years, most multi-way speakers now sound out of focus to me. That was definitely not the case with Furuyama’s Vertical Twin Drive speaker, which features two flat-diaphragm woofers driven by a powerful magnetic circuit. The highs are reproduced by an ESS Heil air motion transformer tweeter. The sound was wonderfully cohesive, fast, with natural harmonic textures. The FLAT(B) driver has a useable frequency range to well over 10kHz, so this speaker fits in fact in the wide-range speaker category. No wonder I liked it so much. The matching amplifier was FAL’s model 6C4C, a push-pull Integrated design featuring transformer coupling and no negative feedback. 2. Focus Audio’s Kam Leung was on hand to expound the virtues of the Signature Series FS 788 Loudspeakers. The sound was well integrated and naturally balanced. This Canadian speaker manufacturer is definitely worth checking out. 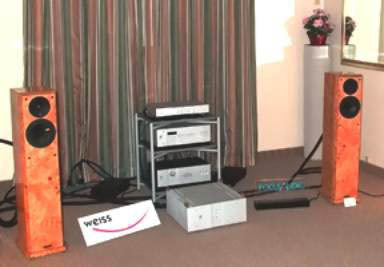 Associated equipment included the Ayre D1 DAC used as CD transport, the Weiss Engineering Medea DAC from Switzerland, the Ayre K1x Preamp, and the Ayre V1x power amplifier. All digital, interconnect and speaker cables were by Audioquest. All power cables were by PS Audio. And in case you’re wondering, the equipment rack is by Foundation Audio. 3. The deHavilland Audio room pretty much had it all: convincing tonal balance, naturally detailed textures, emotional impact, and exceptional soundstaging. 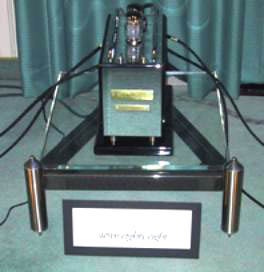 At the heart of it all were the deHavilland Aries 845-G mono block power amplifiers ($6,000/pr.) driving the Alon Lotus Elite Signature ($8,000/pr.) loudspeakers by Acarian Systems. The Alon’s open baffle technology makes other conventional dynamic speakers sound… well boxy by comparison. The digital front end consisted of the Sony SACD -77ES ($2,500) player, and the California Sound Labs 24/96 DAC ($1,500). 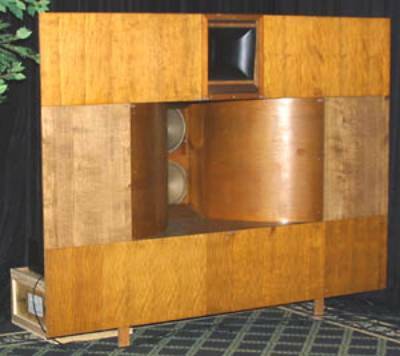 The matching preamplifier was the deHavilland UltraVerve ($3,000). All cable, interconnects, and power cords were by Cardas Audio. deHavilland’s George Kielczynski provided me with a tally for the total cost of the system at $26,189. That just goes to show that system building is far more important to good sound quality than money alone. 4. OK, so it isn’t a commercial product, but the Siemens Bionor horn loaded cinema speaker made by Klangfilm in Germany and dating back circa 1960 was for me a fantastic experience. 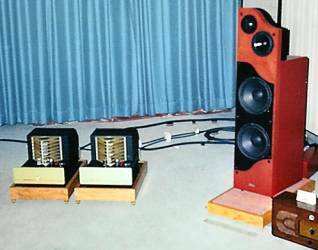 Kudos to LAMM Industries Vladimir Lamm and distributor David Carmeli for going to a lot of trouble in order to display one of the greatest speakers of all time. Visitors were treated to glorious horn sound with stupendous dynamics and unbelievably tactile voicing. Relative to a modern audiophile favorite such as the Wilson Audio Grand Slam, the Bionor is of course a different “cup of tea,” but if I had the room and could find a pair, that’s what I’d be drinking. Associated equipment included the LAMM ML2 power amplifiers and L2 Reference preamp. The LAMM LP2 phono preamp and American Sound turntable fitted with a SME 3012-R tonearm comprised the analog front end. The Weiss Medea DAC and CEC transport made up the digital front end. 5. Moondog Audio’s Maya horn system was in great “howling” mood. Assisted by tube electronics by Emotive Audio, the Maya’s midrange was absolutely divine. The bass wasn’t quite up to par in this small room, but I totally enjoyed reproduction of female voice. Horns again? That’s right: horns done right! 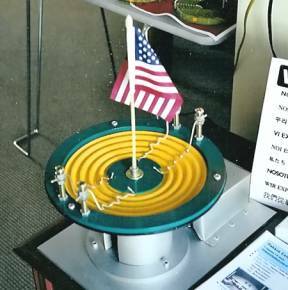 Also part of the system were vibration control products by Symposium Acoustics and power cords and distribution outlets by Essential Sound Products. 6. Eduardo de Lima was on hand in the Audiopax room to demonstrate a new speaker (92dB sensitivity), still in pre-production form. It was driven by the new 15 wpc single-ended Stereo 88 ($5,790), which uses a KT88 in an unusual configuration. The matching pream0lifeir was the Model 5 ($3,970). The sound in this room was detailed and spacious without ever crossing the line into the analytical domain. It’s amazing what can be done on a budget when combining technical know how with a passion for music. 7. The Bluebird Music/Living Voice room proved to be a delight. 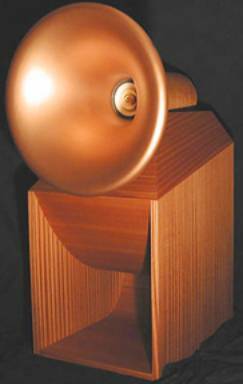 On display were the Living Voice OBX-R loudspeakers ($7,295/pr. ), which for me redefine British sound. Gone was the polite midrange dip. The tonal balance was full bodied with excellent bass definition and smooth highs. Anyone who harbors any doubts about what a musical speaker ought to sound like should give the OBX-R a careful audition. Croft Charisma X preamplifier ($4,495). The front end consisted of the AVI CD player ($1,995). Speaker cable was the Chord Odyssey Bi-wire (9ft pair - $595) and the accompanying interconnect was the Chord anthem (1 meter pair - $595). In the USA and Canada, contact Bluebird Music for more information (http://www.bluebirdmusic.ca/). 8. A sure fire recipe for musical integrity is to combine a world-class electrostatic speaker such as the Sound Lab Millenium-1, Renaissance 3 with a fine OTL power amplifier the likes of the Atma-Sphere MA-2 Mk. II.3 or the M-60 Mk. II.2. And that is exactly what happened in the Sound Lab/Atma-Sphere/Purist Audio Design room. Lord, I love the lower midrange-upper bass range on this system. And the imaging was nothing like those paltry pinpoints produced by mini-monitors. A planar like the Sound Lab synthesizes the full breadth and height of instrumental outlines; enough to take your breath away. 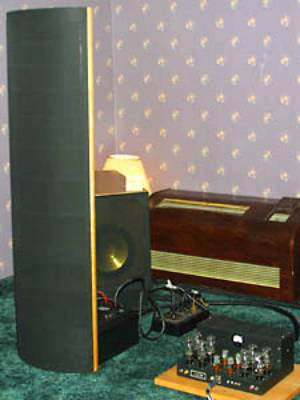 The associated preamp was the Atma-sphere MP-1 Mk. II and all cabling was, of course, by Purist Audio Design. 9. Calix Technology’s Phoenix Grand Speaker is bound to raise its share of eyebrows. It’s unique styling and curvaceous looks transcend the ordinary. Designed and manufactured in Taiwan, the Phoenix blends together several disparate drivers. It’s officially reported to be a four-way five driver system. Frankly, I was worried when I sat down for a listen looking at all those drivers. But much to my surprise, they seemed to blend together pretty well to produce a wide and spacious soundstage - without having the sound tethered to the speakers. The balance was also to my liking with a smooth top end. Graham Engineering introduced a new budget-priced tonearm based on the well-known series 2.2 arms. The Robin ($795) is designed for drop-in mounting for either the Rega or VPI Scout turntables. Features include adjustable anti-skate and VTA. 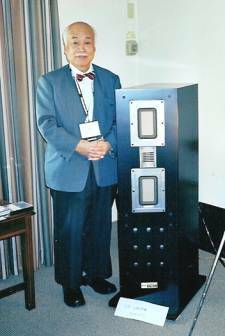 The fabulous Kronzilla mono block amplifiers ($16,900/pr as shown) were on display in the KR Audio room. Based around the KR T-1610 – the largest audio tube in production – the Kronzillas are a perfect example of sumptuous industrial design, combining form and function to forge a classic look. The T-1610 is a fine testimonial to the spirit of Riccardo Kron, who sadly passed away last year after a long battle with cancer. The good news is that KR Audio is in excellent health, and continues to be expertly managed by Eunice Kron. Both tube and electronics production in Prague, the Czech Republic, are on target. I’m glad to report that the audio gods and Eunice Kron have smiled upon me: this lucky dude now has a pair of Kronzillas on hand for review! Stay tuned for a full report. I had the opportunity to meet with Mr. Philip Swift, the present owner of Spendor Audio Systems. He described in some detail Spendor’s new SR5 loudspeaker that has been designed for on-wall installation. Most speakers are not designed to work near a wall boundary, such placement resulting in bass boom. In contrast, the SR5 takes advantage of the wall boundary to produce a smooth bass response. If you’re looking at a home theater installation, be sure to check out the SR5. Sony’s Super SACD format is not only hanging on, but is apparently making more in roads with record labels. Release announcements were forthcoming from Sony Music, Universal Music Group, and EMI. This is a bit surprising, since the average consumer has no clue as to what a SACD is. But the trend is to incorporate SACD into universal digital players capable of handling audio and video DVD formats as well as standard CDs. This may be the perfect time to purchase an SACD capable digital player such as the Marantz DV-8300. This patriotic gesture from a Taiwanese spider manufacturer put a smile on my face. It’s nice to see any pro-US sentiment during these tense international times.